The three judge court ruled today, as a result of the absolute privilege provided by the Constitution for Oireachtas proceedings, the courts have no power to intervene in relation to how those hearings were conducted. The President of the High Court, Mr Justice Peter Kelly, said while the claim was couched in highly jurisdictional claims, the issue of jurisdiction does not properly arise. 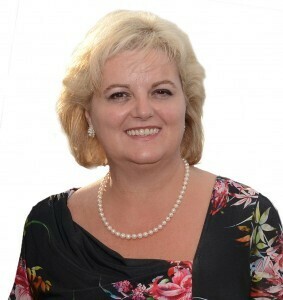 Ms Kerins claimed the utterances by the PAC members that she complained of amounted to some form of adjudication or determination when, in reality, those were just expressions of opinion by the PAC members which were devoid of any legal force. Because these were no more than utterances, that ousted the court’s jurisdiction in this matter, he said. “The Constitution guarantees freedom of speech in parliament, not to protect parliament, but the democratic process in itself,” he said. For the legal nerds: Court confirmed Article 15.13 of Consitution has effect of “ousting the court’s jurisdiction” re Dail utterances. 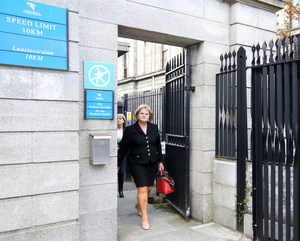 Businessman Denis O’Brien’s action over statements made by two TDs in the Dáil about his banking affairs has concluded at the High Court with judgment reserved. 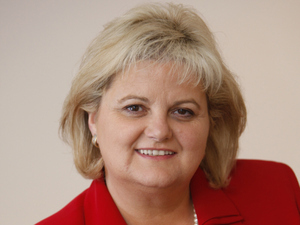 Ms Justice Una Ní Raifeartaigh reserved judgment until the new year and said she would not finalise her decision until the High Court rules on the separate case of former Rehab chief executive Angela Kerins. 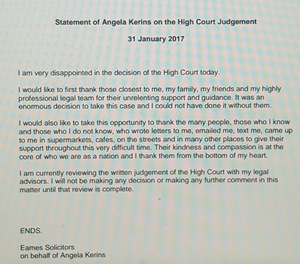 A statement released by Eames Solicitors on behalf of Angela Kerins. Posted in Misc and tagged Angela Kerins., Rehab at 11:44 am on January 31, 2017 by Broadsheet. This is a positive outcome but it is only the High Court – an individual such as Denis O’Brien has both the financial means and the arrogance to take the issue of Dáil privilege to the Supreme Court and the Court of Appeals. Best good news story of 2017 so far. For all his good work knocking back delusional chancers like Kerins since the economic crash began, he deserves a public statue. The implications for Redacted are the massive cherry on top. .. of the high court?? No, of the country. A man who would bring honour and lustre to the office. I appreciate the sentiment, but I believe he’d do more for the country as president of the high court. Let joy be unconfined. Kudos to Mr Justice Kelly – a rigorously honest and proper man. May the full costs be visited on that viper.